Project ‘Via Verde’ which means ‘green way’ is a citizen-led initiative that aims to fight pollution, beautify the cityscape and reduce the stress levels of motorists. Can something like this be done in Indian metropolises? 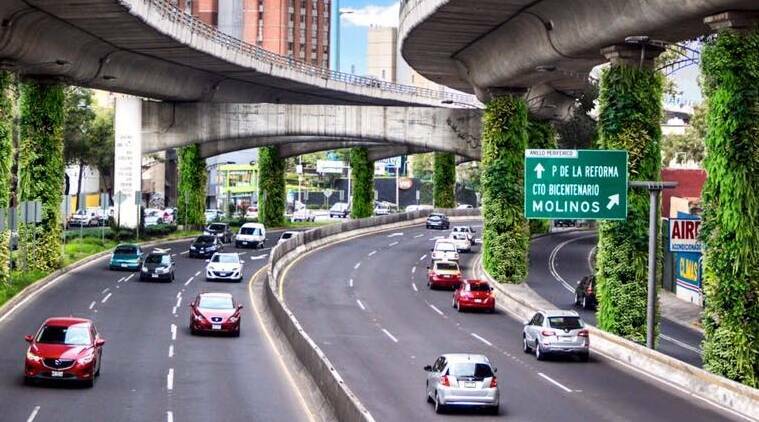 In 2016, Mexico city undertook the initiative of turning its 1000 plus columns supporting flyovers and elevated roads into ‘vertical gardens’ in a stretch of 27 kilometers. Following alarming levels of Ozone in the environment, the city that already tightened vehicle restrictions tried this new approach. Project ‘Via Verde’ which means ‘green way’ is an initiative that aims to fight pollution, beautify the cityscape and reduce the stress levels of motorists. The columns — to prevent damage to them — are covered with green walls that are made up of a metal frame and a cloth of special density that allows the roots of the plant to interweave with it. Instead of ground soil, these plants grow in pockets of soil held within the cloth. The gardens have an automated, remotely monitored, irrigation system which absorbs and makes use of rainwater and is additionally supplemented with treated water. Via Verde aims to provide an additional 40,000 square metres of greenery to the city to lift not only the air quality, but also moods and productivity of its 20 million residents. The self-purification ability of plants has a certain absorption effect for fine particulate matters. The project is slated to produce enough oxygen in a year for more than 25,000 citizens, in addition to filtering more than 27,000 tons of harmful gases, capturing more than 5,000 kg of suspended dust particles and processing more than 10,000 kg of heavy metals from the air per year. In most Indian cities, the tree cover is lower than the minimum optimum norm. Last September, there had been murmurs that the AAP government was inspired by the same idea and planned to develop greenery under Delhi flyovers, but there has been so far no further update or indication of such a plan materialising. Delhi needs quick decisive actions to improve its air quality. Last November, post-Diwali, air pollution in the city hit new highs which heightened its notoriety, at least briefly, for the worst air quality readings on Earth. While Beijing’s air pollution levels spawned public protests, widespread use of pollution masks and a state declaration of ‘war’ on polluting culprits, the political response to Delhi’s situation has been quite diffuse and rather muted. We even failed at removing ageing cars from the roads — the scheme which was drafted by India’s Union road transport and highways ministry in May 2016, has not been approved by the Centre so far. In the 1990s, Mexico City became internationally known as arguably the most polluted city in the world at the time. 6 out of 10 residents in the city are known to suffer from respiratory ailments. It is worth observing that what seems to be working for Mexico City in turning itself around on a greener and more sustainable path is a combination of an efficient environment administration and a robust, participatory drive of its citizens. Via Verde too has also been a citizen-led initiative. The project director, architect Fernando Ortiz Monasterio, and well known Mexican producer-actor Luis Gerardo Mendez imagined the possibility of installing a garden in the most congested avenue of the Mexican capital. The duo proposed to convince the city government of their project plan of vertical gardens and used the actor’s influence among the common citizens, especially his sizable Twitter following, to launch a public petition through Change.org. After the petition gathered more than 80,000 signatures, the Government of Mexico City authorised the installation. Donors, local government and advertisers have been helping fund this project. “We can say that the form of funding was determined through a survey in which people decided that private companies should provide resources for the project. I think it is the best way, because this should not be a programme that diverts public resources, but one that complements the environmental policies of the government,” said Ortiz Monasterio in an interview with Daniel Casillas. In Delhi, the pollution problem is unlikely to be solved without implementation of strong, state-backed policies, but Project Via Verde is a powerful example of civil society’s engagement with problems affecting them through innovative thinking and collective action using a digital platform. It also has a more sustainable funding model through a combination of public money and private advertising. Can something like this be done in Indian metropolises? Let’s hear in the comments section.